Located right on the French side of St. Martin, Blue Beach Villa is a great beachfront home with tons of privacy, modern design, and ocean views. The pool and the shady gazebo overlook the sea, and there’s more than enough space to sunbathe or snooze in the shade. Blue Beach is hard to beat, but to make things even better, you can rent its sister villa, Turtle Nest, for four more bedrooms. Blue Beach Villa is a gorgeous beachfront vacation rental on Long Bay Beach. Golden sand, endless views, and the turquoise sea are steps away. Listen to the surf from Blue Beach’s oceanfront living areas, relax above the powdery sand in the dining gazebo, or take a dip in the pool. 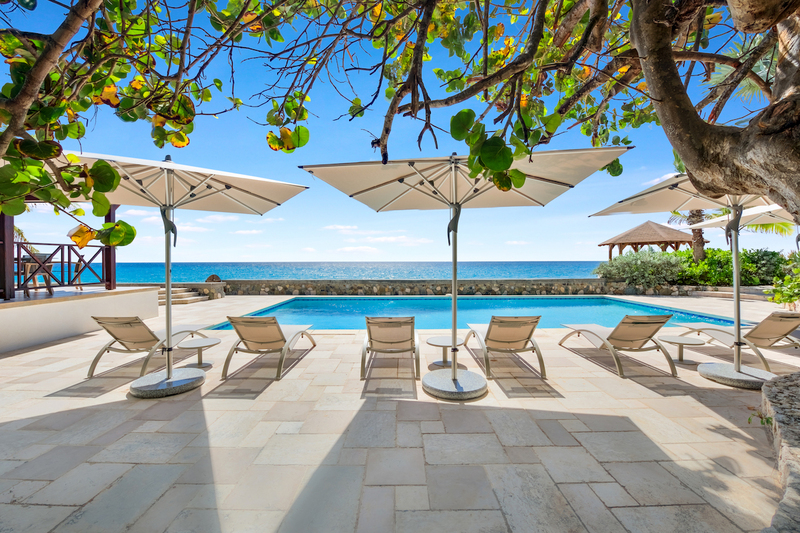 The infinity pool is bordered by ocean views, a short stone wall, and shaded loungers. The gas barbecue and the poolside gazebo makes al fresco dining easy, and the lush, gated grounds provide ample space for afternoon walks or picnics. The open-concept veranda features ceiling fans, wicker furniture, and a wooden dining table. The breakfast bar connects to the kitchen, and a glass wall on the veranda opens to the Great Room. Laidback wicker chairs in the sitting area amplify the villa’s relaxed ambience, and a flatscreen TV with satellite and Netflix, a stereo system, and WiFi add a modern touch. The gourmet kitchen has stainless steel appliances, an indoor and outdoor bar, and a sleek design. Two bedrooms off the Great Room and two at the other end of the pool terrace create privacy, and each has an ensuite bathroom, TV, and Netflix. The Great Room suites have king beds, the third suite has a king bed, and the fourth suite has two twins that can convert into a king. The third and fourth suites both have exterior access to the veranda. A poolman, housekeeper, and gardener maintain the villa daily. Long Bay Beach, also known as Baie Longue, offers a great swimming spot in front of the La Samanna Resort. A short walk in the other direction leads to Plum Bay, and a ten-minute drive leads to Maho’s restaurants and shops. Blue Beach can be reserved on its own or with its sister villa, Turtle Nest, for an additional four bedrooms. Directly on Long Bay beach. Guests of the villa are welcome at La Samanna Resort for watersports, restaurants, beach bar and Spa services. Beach chairs are reserved for the guests of the hotel so bring your own. First arrival transfer is complimentary; any additional arrival transfers, as well as all departure transfers are paid by guest. Guests are greeted at the airport arrivals exit by our driver, accompanied to retrieve their rental car, then guided to the villa. If guests wish to have cars delivered to the villa, they will be met at the airport by the driver and transferred to the villa. Welcome, however all bedrooms have exterior access only.